Flow-Through Chambers Example of the flow-through set-up used to measure denitrification activity in oyster guts and shell. Each chamber contains live oysters. © A. Arfken/VIMS. When it comes to oysters and their role in reducing nutrient pollution, a new study by researchers at William & Mary’s Virginia Institute of Marine Science gets right to the guts—and the shell—of the matter. 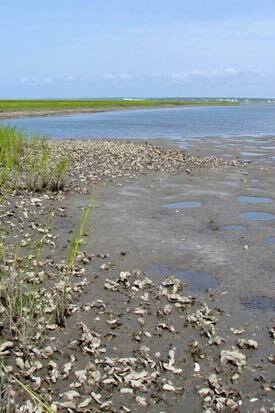 Denitrification is the process by which nitrate and nitrite—compounds that fuel over-fertilization of coastal waters—are reduced to nitrogen gas, which is harmless to aquatic habitats. Excess nitrogen from wastewater treatment plants, farm fertilizers, and other human sources can lead to low-oxygen “dead zones,” reduced fisheries harvests, and loss of sea-grass habitat. 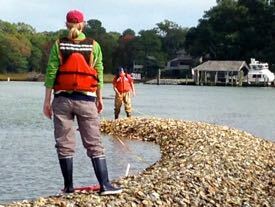 Chesapeake Bay is one of many ecosystems worldwide that have suffered these impacts. “Most studies addressing denitrification associated with oysters have focused on sediments in and around oyster reefs,” says Arfken. “Ours is the first to explore the capability for denitrification by microbiomes living inside and on the oysters themselves.” A “microbiome” is the community of microscopic organisms that inhabit each and every living thing, from the mites that dwell amid your eyelashes to the bacteria lodged among tomato roots. That challenge is both financial and logistical. “Studies of an organism’s entire genetic make-up—its genome—are very expensive, and may not work for samples where the contribution from microbes is low,” says Song. “As a result, many studies rely on amplicon sequencing of ribosomal RNA genes to identify microbial taxa.” This approach is less expensive, but offers limited insight into the metabolic pathways associated with different microbiomes—in this case whether they possess the genes needed for denitrification. To address these challenges, the team employed a new technique developed by Bowman. Called “PAPRICA”—for PAthway PRediction by phylogenetIC plAcement—it allows researchers to infer metabolic pathways from gene sequences associated with a small subunit of ribosome called16S rRNA. “We found that bacteria carrying nosZI genes are important denitrifiers, and facilitate nitrogen removal in oyster reefs,” says Arfken. But the researchers remain optimistic. “We’re excited to pursue more studies to further validate the use of gene-based metabolic inferences as a reliable method for assessing the metabolic potential of microbiomes,” says Song.